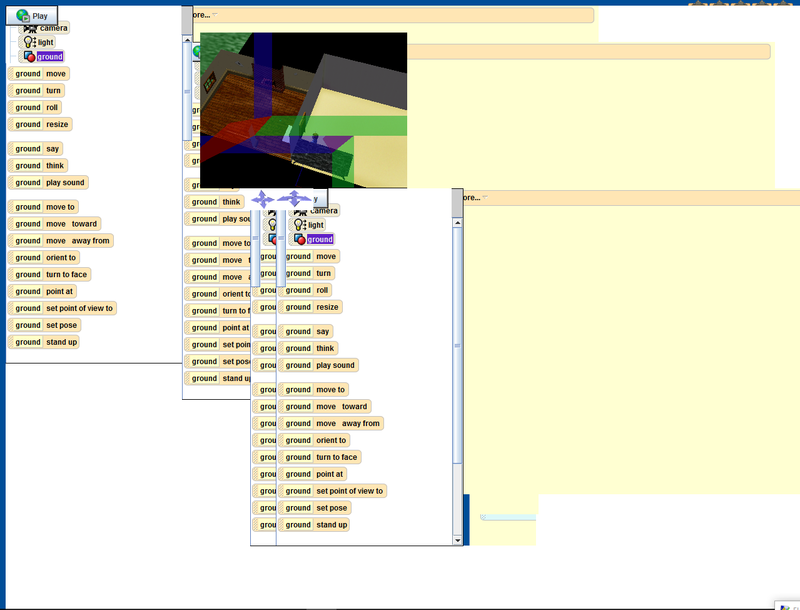 Recently I've been having problems with Alice where, whenever I try to edit an Alice world, everything will glitch up and appear in places where it shouldn't be. It's still possible to edit the world and run it normally, but these glitches make it very difficult to see what I'm editing, which is bad. This problem has been confirmed to happen on at least two different computers. Both of them run Windows 10, which I thought may have been the cause of the issue, except that one computer had been running Alice on Windows 10 for months with no issues until just recently. Here's an example of what the problem can look like. Thats really weird, I assume you tried reinstalling Alice? Perhaps it might be an issue with your graphics card driver, I had to reinstall mine to fix an issue I had with Unity. I've also experienced this before, and I do have a way to sort of fix it. In the preferences, change the renderer from DirectX 7 to JOGL. What's a bit annoying is that while this works for editing, I find that it makes playing the world quite different and a bit worse (increases lag, makes objects brighter or darker based on size, messes with textures, etc. ), but it nonetheless usually fixes the problem.